PNNL scientists used real-world observations to simulate how small clouds are likely to stay shallow, while larger clouds grow deeper because they mix with less dry air. 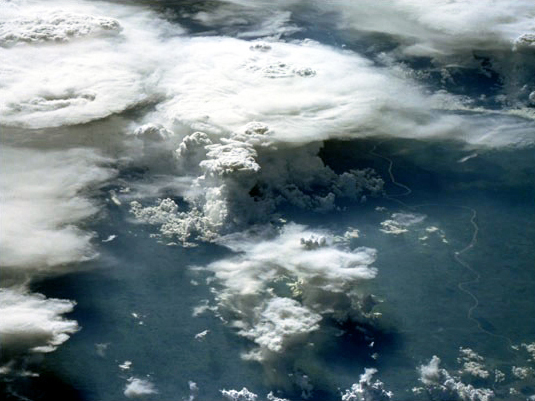 Pictured are small and large thunderstorms growing over southern Brazil, taken from the space shuttle. It’s important to understand how tropical thunderstorms develop. Large storms can cause flash flooding from a downpour in a short period of time. Image courtesy of NASA’s Johnson Space Center. Enlarge Image. Results: Big clouds get bigger and small clouds shrink may seem like a simple statement, but the myriad mechanisms behind how clouds are born, grow, and die are surprisingly complex. These very mechanisms may be key to understanding future weather patterns and global climate change. In a study published in the Journal of Geophysical Research: Atmospheres, a team led by scientists from Pacific Northwest National Laboratory examined how well a state-of-the-art high-resolution model simulated tropical clouds and their interaction with the warm ocean surface compared to real-world observations. They found that factors as small as how sizes of raindrops were represented in the model made a big difference in the accuracy of the results. Why It Matters: Scientists need to understand clouds to effectively predict weather patterns, including the potential for droughts and floods. Until recently, computer models for simulating climate on a global scale relied on mathematical formulas to approximate how clouds were born and grew. Those formulas did not always reflect reality. With more advanced computers came the ability to explicitly simulate large-cloud systems instead of approximating them. Still, scientists wondered whether results from those high-resolution models were accurate compared with real-world data. This study was an important first step in identifying the modifications needed to make sure these cutting-edge models are up to the challenge of simulating the true lifecycle of clouds. "Our study highlights the utility of using observations to evaluate how well the next generation of climate models, called cloud-permitting models, can directly capture the behavior of clouds," said Dr. Samson Hagos, the PNNL scientist who led the study. "While these newer models cannot completely overcome some challenges, they do represent cloud size-depth relationships fairly well." Methods: Scientists from PNNL and their collaborators from NASA Goddard Space Flight Center and the National Center for Atmospheric Research used high-resolution regional models to simulate cloud lifecycles with different ranges of rain-drop size. They compared those results to observational data collected from the Atmospheric Radiation Measurement (ARM) Climate Research Facility's Madden-Julian Oscillation Investigation Experiment (AMIE) and the Earth Observing Laboratory's Dynamics of the Madden-Julian Oscillation (DYNAMO) research campaign. The AMIE/DYNAMO campaign collected data in the South Pacific from October 2011 to March 2012 to support studies on the birth, growth, and evolution of certain types of clouds. 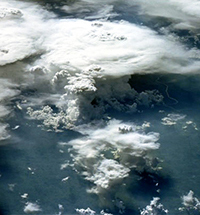 The scientists used satellite and ground-based radar measurements from the campaign to examine how well the Weather Research and Forecasting Model simulated tropical clouds. They looked specifically at four approaches to handling the physics of tiny raindrops. Two key factors were rain rates at ground level and the modeling of cold pools, the cold dry air flowing out from deep thunderstorms. The simulations clearly showed that larger clouds tended to grow larger because they capture less dry air, while smaller clouds dwindled away. These simulations matched observations. On the other hand, the model faltered when simulating cold pools. The team modified the way raindrop physics was simulated, yielding results that more closely matched observations. What's Next? Based on these results, scientists will focus on cold pools and their role in growing small shallow clouds into large, deep ones. The team will use simulations with even higher resolution and more data from the AMIE/DYNAMO campaign. Sponsors: The U.S. Department of Energy's Office of Science, Office of Biological and Environmental Research, sponsored this work as part of the Regional and Global Climate Modeling Program and Atmospheric System Research Program. Facilities: Scientists obtained data from the ARM Climate Research Facility and the National Center for Atmospheric Research Earth Observing Laboratory's DYNAMO Data Catalog. The National Energy Research Scientific Computing Center and Oak Ridge Leadership Computing Facility provided computing resources for simulations. Research Team: Samson Hagos, Zhe Feng, Casey Burleyson, Kyo-Sun Sunny Lim, and Chuck Long, PNNL; Di Wu, NASA Goddard Space Flight Center; and Greg Thompson, National Center for Atmospheric Research. Reference: Hagos S, Z Feng, C Burleyson, K-S Lim, C Long, D Wu, and G Thompson. 2014. "Evaluation of Convection-Permitting Model Simulations of Cloud Populations Associated with the Madden-Julian Oscillation using Data Collected during the AMIE/DYNAMO Field Campaign." Journal of Geophysical Research: Atmospheres 119(21):12,052-12,068. DOI:10.1002/2014JD022143.